On Ireland's Wild Atlantic Way! A beautiful, modern, newly extended three bedroomed, self catering rental house only five minutes drive from the bustling market town of Kenmare in the south west of Ireland on the Ring of Kerry. This self catering vacation cottage, which is in its own grounds of over two acres alongside the Cleady River has a (hidden) waterfall giving the relaxing sound of running water, has all the conveniences you would require on a self catering holiday. This self catering cottage has Wi-Fi, satellite TV, washer, dryer, dishwasher, safe and three bedrooms which sleep up to six (two doubles and one twin). Two bedrooms are en suite with a further bathroom for the third room and a separate guest bathroom with wet room. A cot and high chair can be made available on request at no additional cost. For those cooler evenings and nights there is an open fire place for burning logs and turf. Relax in the sittingroom with a feature fireplace and stove whilst listening to your music through the BOSE stereo system. We welcome well behaved house trained pets (small fee applies). Kenmare is a beautiful heritage town located in Kerry, southwest Ireland. It is about a 2 hour drive from Shannon, 90 mins from Cork and 3.5 hours from Dublin. We fell in love with Kerry and Kenmare in particular in 1990 and spent the following 12 years trying to find the site to build our holiday cottage. It took us longer than expected but we love the house and its location so close to Kenmare! We hope you agree! We love the natural stone finish and warmth that the cottage has. With the new extension of a sitting room and guest bathroom we now have all the space that a family or couple could want for their vacation in Kenmare. An open fireplace and now a stove are just wonderful to light and sit in chatting and talking about the days adventures while sipping a glass of wine! This cottage is in a large garden of about two acres, the Cleady River flows to the rear and sounds so relaxing when sitting on the patio at the end of a busy day sightseeing! With wi-fi, you can investigate where to visit on the following day or catch up with emails. The kitchen is equipped to a very high standard with all the equipment needed to prepare your own gastronomic feast - all you need are the ingredients and ability! We also have a small safe for storing your valuables. Wi-Fi broadband is available for guests use for general web browsing, email and planning. Because it is a mobile signal the download capacity is limited and not suitable for streaming or gaming. Satellite signal with full range of channels from SKY including SKY Sports. Cleady River Cottage was just as John Wallace said it would be. Well appointed, comfortable, great location and his personal touch if we needed help with anything. We have visited Ireland many times and this was one of our best experiences. We look forward to another stay at Cleady River. Enjoyable stay.Perfect location.Delightful spacios cottage. 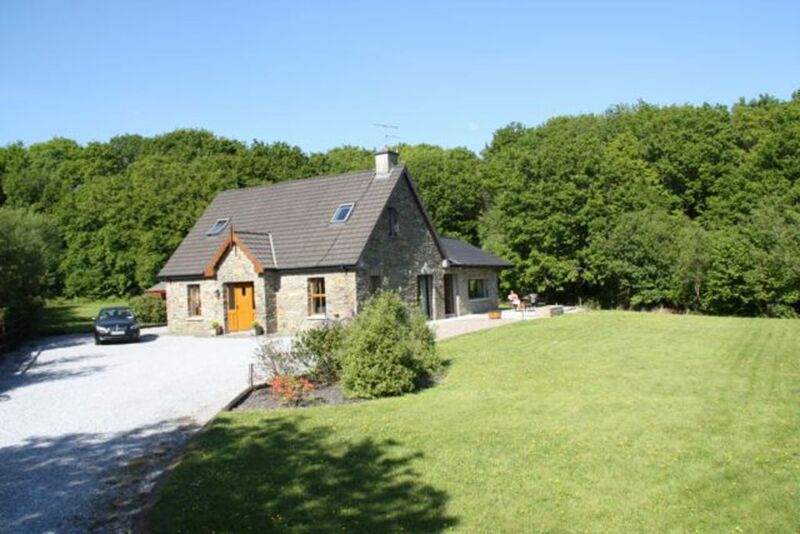 This wonderful cottage is perfectly situated for enjoying the delights of the south wast corner of Ireland. Comfortable and spacious with private large garden area. Its a short drive to kenmare.Aldi is situated on way in and taxi service is punctual and reliable. It was our 2nd visit and will be back again. The property is beautiful has a couple of little issues. There is a problem with the hot water it gets scolding hot and you can’t adjust. Was coming out hot in cold water taps everywhere except kitchen. Made showering an experience. The kitchen was fully equipped but the cabinets where very unorganized and the oven definitely needed cleaning. The bedding was very comfortable except the top covering was heavy and hot and there wasn’t any top sheets. Towels plentiful but needs the cupboard sorted out. Difficult to locate with google would advise a sign at top of driveway naming cottage. The fireplaces where great and layout works very well. Beautiful piece of property with lots of privacy to enjoy the yard in nice weather. Sorry to hear the oven wasn’t clean, we will take this up with the caretaker immediately. The hot water (immersion) should only be used to heat the water up as required but if left on too long it can get extremely hot and that’s why we recommend only using it as required. The directions on Google maps are correct but because the cottage is down a small grassy lane it is very private and secure and we’ve now updated the directions for future guests! We stayed for a week in May, four adults and two children 8 and 10. The house is in an ideal location for us, a 5-minute drive to Kenmare shops, galleries, stores and pubs. It is also centrally located for our several day trips to Blarney Castle, Killarney National Park, Molly Gallivan's Cottage and Kissane Sheep Farm (for sheep dog herding demonstration). The accommodations suited us perfectly... plenty of space to be together - or to be apart for private moments. The house was well equipped with appliances and utensils, and even some cooking aids (spices, etc.). There is also ample yard for the young ones to run around. We are likely to return. We have only two helpful suggestions...an outdoor cooking grille would have been nice, and a stronger WiFi signal. But no complaints. We were very pleased with our stay. Our party of 6 decided on Kenmare as our central location while visiting western Ireland. This beautiful house had everything you want or need in a vacation rental.there were 4 full bathrooms.and 3 bedrooms ( one downstairs and the others up stairs). Kitchen was nicely equipped with everything we needed. It would have been nice to have had a grill the night we cooked a rack of lamb but the oven did fine. The caretaker was great to answer any questions we had. The two times we had to call him. Double check with the owner about directions to the house because we had to contact & follow the caretaker to the house the first time there. No problem after that first time. 3 good groceries in Kenmare but the Super Value is by far the best. You will love this cottage. In South West Ireland on the Wild Atlantic Way (the world's longest mapped coaster drive) is County Kerry, known all over the world as 'The Kingdom'. The Jewel in the Kingdom is a beautiful heritage town named Kenmare which is on the world famous Ring of Kerry. Cleady River Cottage has three bedrooms and is only a five minute drive from Kenmare town and is perfect for a relaxing self catering vacation. Relax after a busy day's sightseeing in this modern stone cottage with all the modern conveniences of home. The cottage is a five minute (or approx 30 minute walk) from the town and is a lovely private setting of about two acres. The cottage isn't overlooked and is extremely private and you can sit on the deck and listen to the adjoining Cleady River and it flows past the back garden whilst you enjoy a glass or two! Golf: Two lovely courses are very close by - Kenmare Golf Club and Ring of Kerry are both within fifteen minutes drive of the cottage. Mahony's Point and Killeen are about a forty five minute drive away and world famous Waterville is about the same.